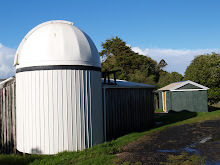 Last night Jonathan & Steve met up at Kumeu Observatory to take advantage of the clear skies and get to work on collimating the "Nustrini" C14, Jonathan arrived first and while waiting for Steve set about focusing the camera and doing some pointing tests, from the outset he was hit with frosting on the CCD, this happened 4 times before we decided to run the camera at -15 instead of -20, this seemed to resolve our frosting issues on the night but what is certain is that we either need to cook the desiccant again or replace it with a new one, also had an issue with dew on the inside of the corrector plate again and found this was due to the dew strap not being warm all the way around, it looks like we are using a dew strap that is not designed for a C14, so after adjusting the dew strap so it was providing heat to the affected area and taking off some of the masking tape over the vents so that we could air out the optical tube, thankfully this seemed to to do the trick as the dew eventually disappeared. Grant at Stardome has experience a similar problem with dew on the inside of the corrector - whilst sealing any small holes is great to prevent dust setting into the system it is also preventing adequate ventilation, and any humid air in the tube is unable to be circulated out. .After Steve arrived we set about collimating the telescope, we used CCD inspector and defocused a single star into an annulus. It appears we don't have enough "travel" on the TCF focuser to defocus the star enough, so we needed to manually defocus to get the start image big enough for the CCDInspector process. Starting off by identifying where on the image the collimation screws were in relation to the image (by making a shadow with my hand) it was easy to see which screw to adjust - basically the one which "moves" the image in the direction of the line on screen. 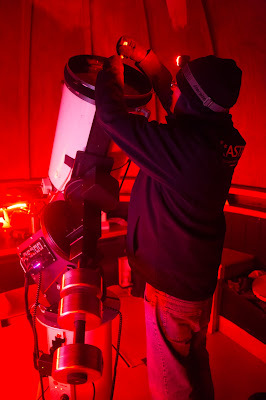 After making the corrections that CCD inspector gave us we improved the collimation then moved onto using the multi star collimation feature of CCD inspector, we used an open star cluster near the zenith but after a few attempts we ended up making the collimation worse so ended up having to star over ! Steve Hennerley collimating the "Nustrini" C14. 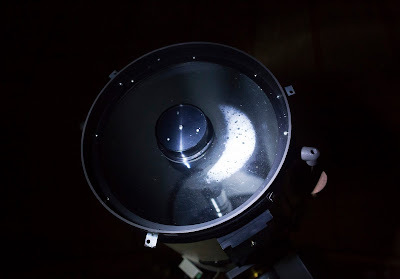 When we did start over though, and had to manually refocus and start again with the single star, we learned that our "shipping bolts" we installed to combat "mirror flop" may be causing us more problems than they are solving. If we leave them loose enough so they don't interfere with the mirror, they are probably ineffective, and we've noticed they loosen up as we slew around (as the mirror cell is moving we guess). If we tighten them however (or more correctly, tighten the focus against them) then there is a significant deflection of the mirror affecting collimation. 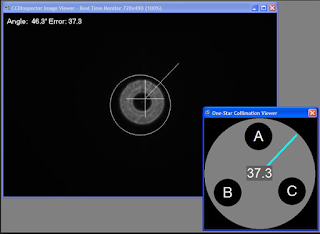 The shipping bolts are not opposite each other - rather they are 120degrees apart and opposite the focuser (if you imagine the CCD inspector picture of the collimation screws above as being the back of the scope, the focuser is at "A" and the two bolts are at "B" and "C"). This has the end result that the mirror is pivoted along the A to "B-C midpoint" axis. This may need revisiting - but for now we left the bolts "just" touching the mirror cell. We ended up collimating the telescope until about almost 3 am in the morning, we could definitely see a huge improvement in the images and the shape of the stars, after Steve left Jonathan managed to focus a star near the zenith at a FWHM of 1.7 arc seconds per pixel, after taking a few test shots he could really see how improved the images were but we will need to monitor the situation because if the primary mirror is flopping we can expect the collimation to degrade fairly quickly, with another clear night tonight Jonathan and Steve plan to catch up again and see what else can be done in preparation for the forthcoming microlensing season. Posted by Jonathan Green & Steve Hennerley.